In November, amidst other lazy Fall activities, I shed my sloth and torpor and built a zero IF, [ ZIF ] or AF phasing direct conversion receiver module for my Jovian pursuits. After re-reading Chapter 9 of Experimental Method in RF Design (now out of print), a sketch arose and I ran to the bench to make some sparks. I closely followed much of the circuitry designed by Chapter 9 author Rick, KK7B and also incorporated stuff I've learned from Wes, W7ZOI. 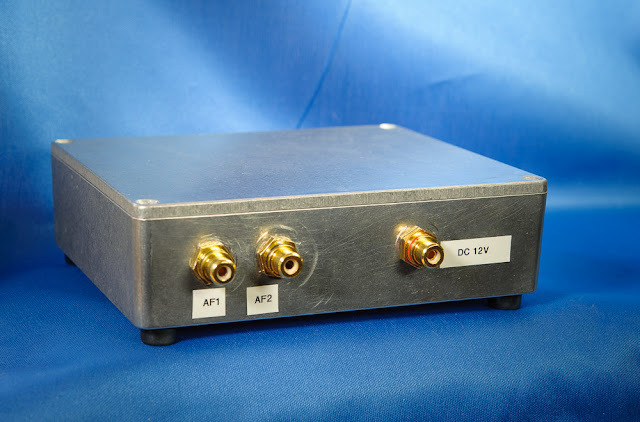 Above — First real-world test of the new (unlabelled) receiver in my modular radio astronomy system. 1 less noise side band to deal with makes me happy. 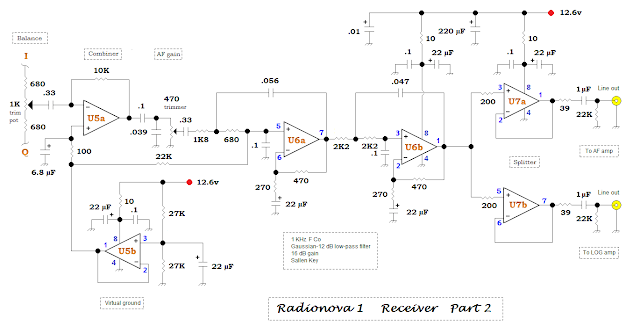 Above — Schematic Part 1 shows the design from the RF input to the outputs of the I and Q channel arm all-pass networks. I opted to in-phase split the RF signal with the popular, broadband, 3 dB hybrid splitter because it's simple and worked well in past adventures. 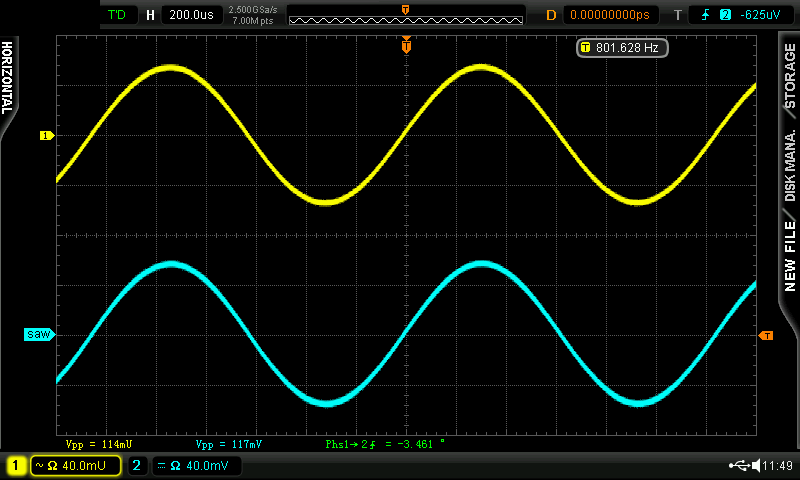 Above — A GPLA simulation of the input filter's S21 ( gain ) & S11 ( match into 50 Ω @ the input ). 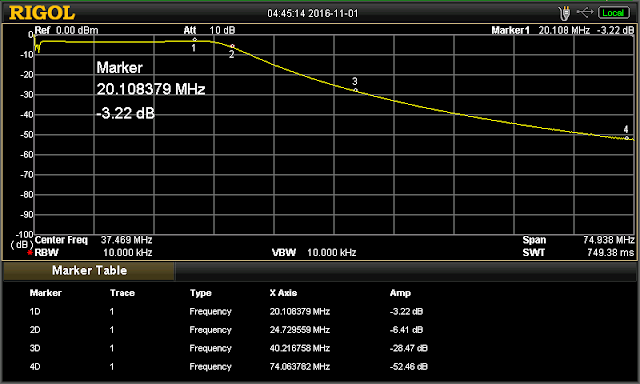 The filter will match a 50 Ω antenna with >= 20 dB return loss from 20.56 to 22 MHz. My target = 20.1- 20.3 MHz, but this = close enough and importantly, plys standard value capacitors. It's important to place a filter after the MMIC preamplifier shown in Section 3. 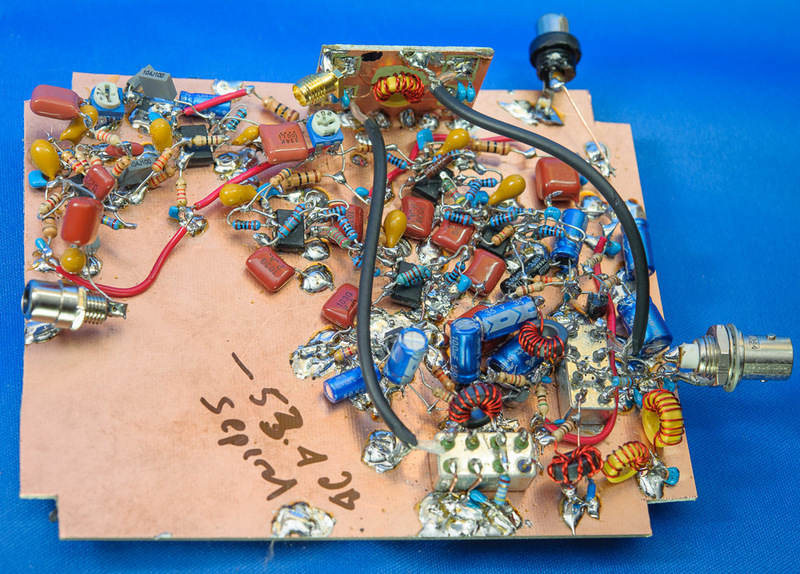 Above — A sweep of the input filter + 3 dB hybrid splitter after I affixed 2 temporary SMA RF connectors and connected a 51 Ω shunt resistor across the unused output port. 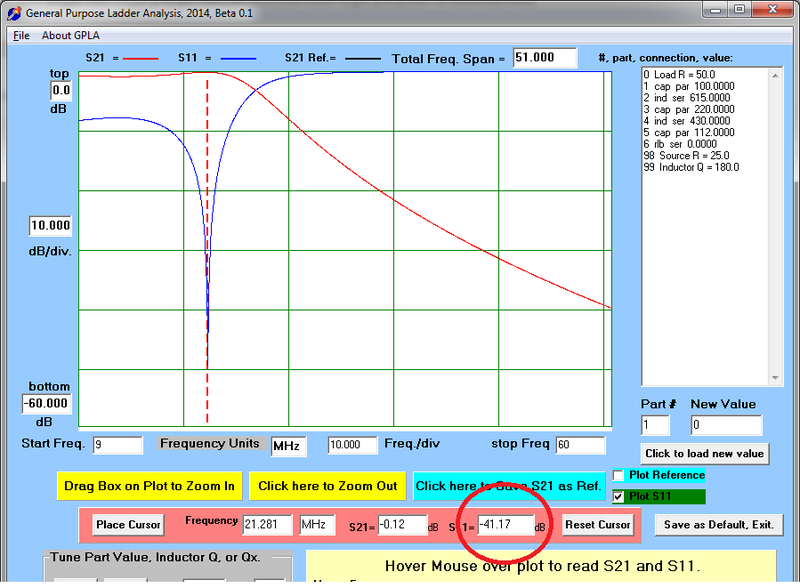 The measure is what really matters in RF design ! After a little tweaking of the inductors by spreading or squishing the windings, I tweaked the stage's attenuation to 3.22 dB; showing my match and gain at ~20.1 MHz look great. I wound the coils on a T37-6 and a T44-6 toroid with # 26 gauge wire. Does omission of a diplexer and just going with a 50 Ω high-pass shunt network + an RFC seem reckless? Perhaps, just frugal. 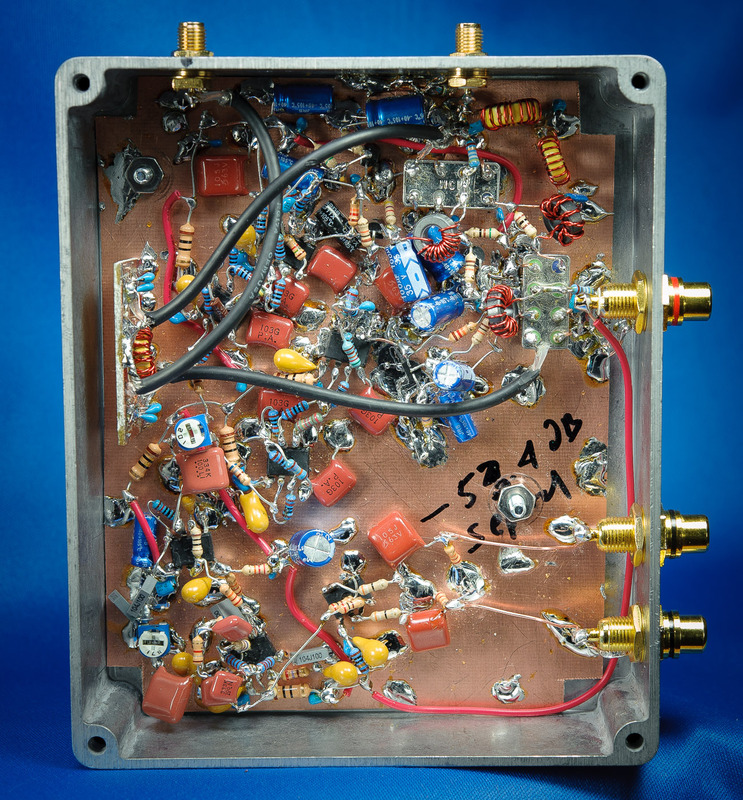 I stuck with the post mixer AF common base preamp popularized by Roy Lewallen, W7EL and promoted by Rick, Wes and others. collector DC voltage of 5.95v -- this provides about 1/2 VCC virtual ground bias for the op-amp chain that follows each common base amp. The final DC output voltages -- and AC test signal voltages ( when I injected an AC test signal to the input of each arm ) were within 2% of each other for the 2 arms. 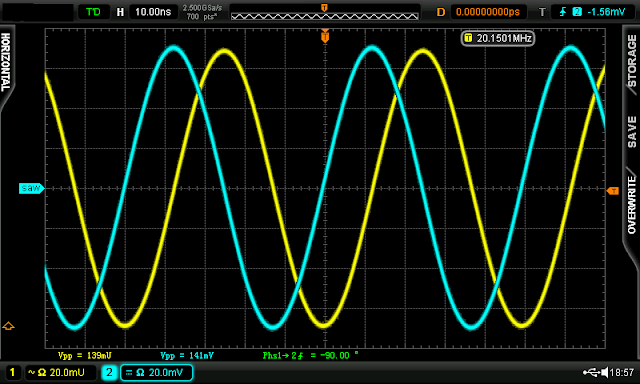 In a ZIF receiver, we want such parity to glean optimal opposite side band suppression. Apart from phase, the I and Q channels should look like each other when viewing with instruments and your physical layout. 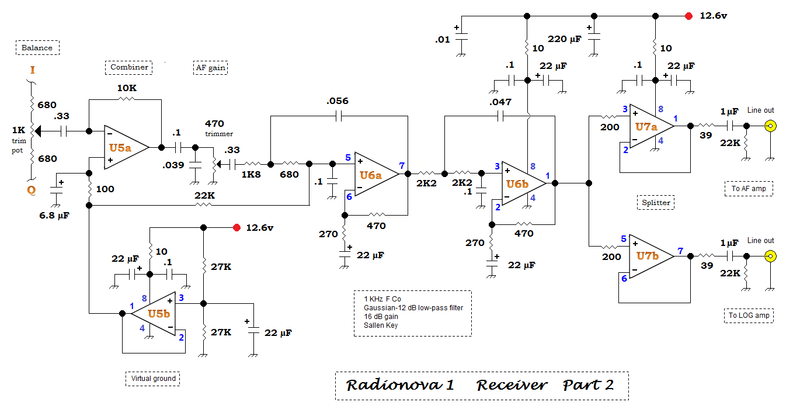 The op-amps U1-U4 follow Rick, KK7B's designs. I chose Rick's all-pass network R and C values for 2 reasons. Since 1995, this design enjoys constant replication and proof of function via measurement by many builders  I collected these 1% metal film resistor values and had them on hand. Our best circuits are always built using whatever parts we've got on hand. These network values offer the potential for 60 dB opposite side band suppression from 270 - 3600 Hertz. 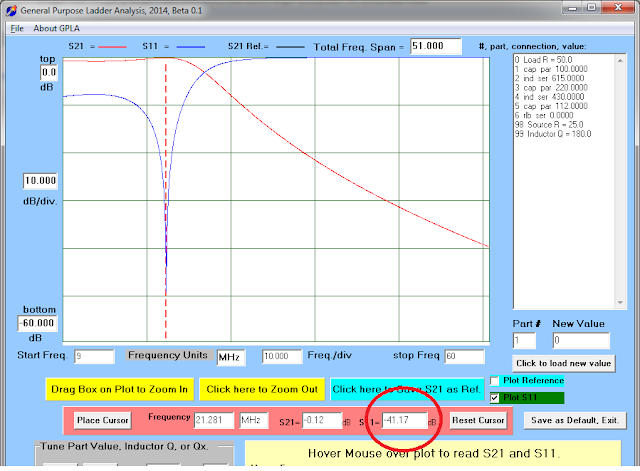 As it turned out, I did OK --- at a 1 KHz offset I measured upper side band suppression at 55 dB! My best effort to date. 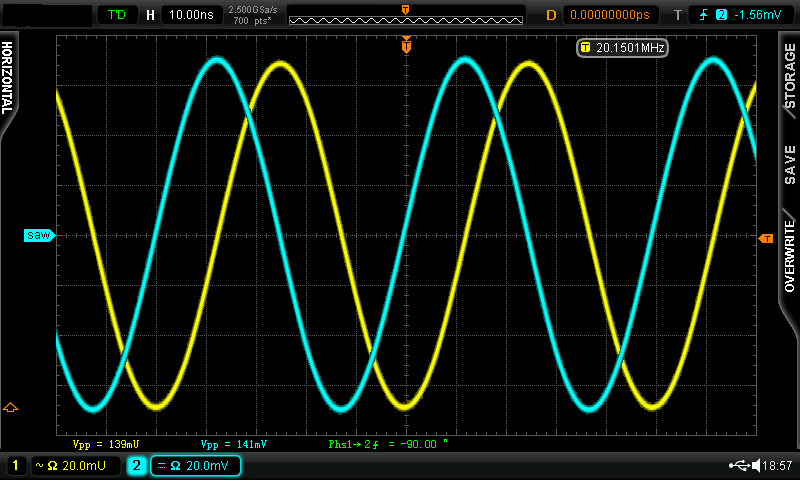 I've designed all-pass filters, but lack the 1% resistors to build them right now. Click for my blog page covering 90 degree phase shifts. Above — Schematic Part 2. 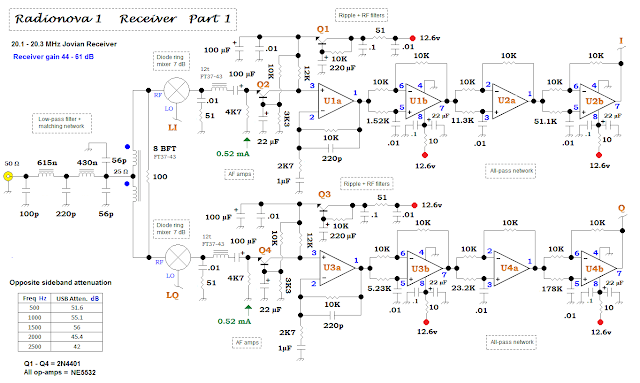 A 1K trimmer allows you to set whatever ratio of the I or Q channel needed to optimize side band suppression. A 470 Ω AF gain trimmer pot allows the receiver gain to vary from ~ 44 - 61 dB. I normally choose around 50- 54 dB gain and then make up the additional needed AF gain with the AF power amp -- or gain control circuitry in the log amplifier system. 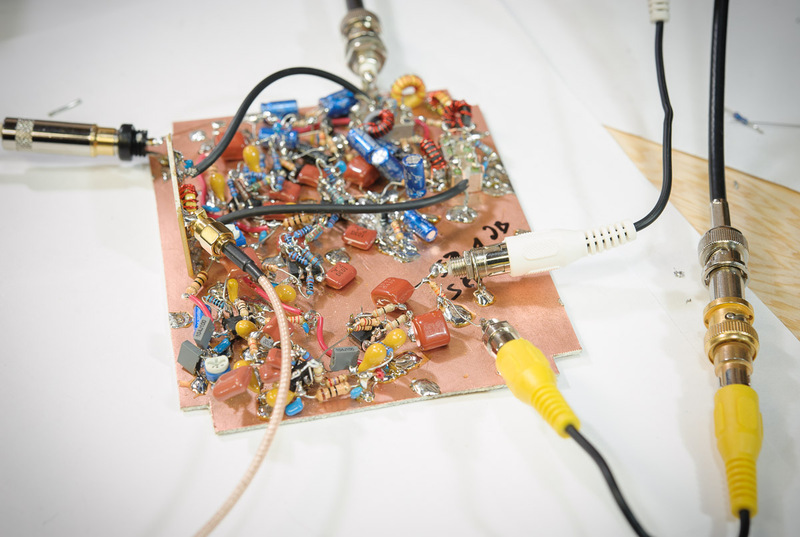 1 op-amp virtual ground establishes 1/2 VCC on all the op-amp + pins. In my first Jupiter receiver, I chose 6 poles of low-pass filtration with a 3 KHz cut-off. In this design, I opted for 4 poles with a 1 KHz 3dB cut-off. Note the filter response = Gaussian - 12 dB. The meandering G-12 dB group delay sounds the best to my ears -- and never rings. I learned this from Wes. 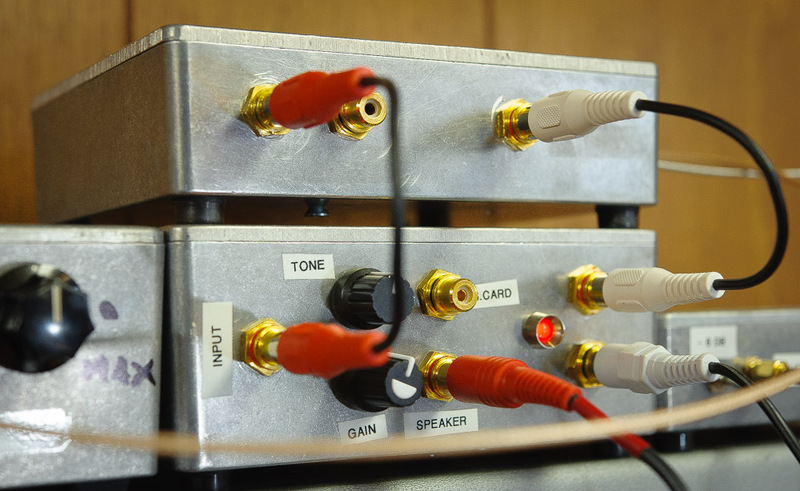 Choose a lower cutoff frequency, less poles and make it a Gaussian response for great sound. I also do this for crystal ladder filters. We're listening to galactic noise and not competing in the CW sweepstakes after all. The signal gets bisected by U7. 1 signal goes to the AF amp module, the other to the log amp for output into an S-meter, plus an ADC. Above — The output of both AF line outputs @ ~ 802 Hz offset with -73 dB available RF power at the receiver input during some testing. 1 bench cable was long, the other short and this resulted in a slight phase shift! 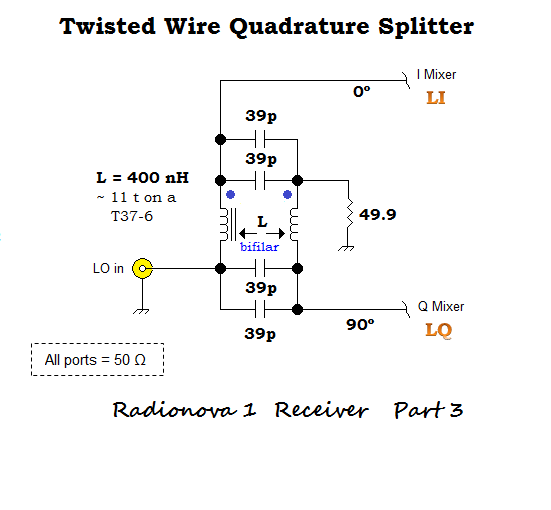 Above — The Fisher, twisted wire quadrature hybrid employed inside this receiver to drive the local oscillator ports of the 2 mixers 90 degrees apart. Equal length RG-174 coax line connect the quadrature to the mixer LO ports, LI and LQ. Above — Serendipity. 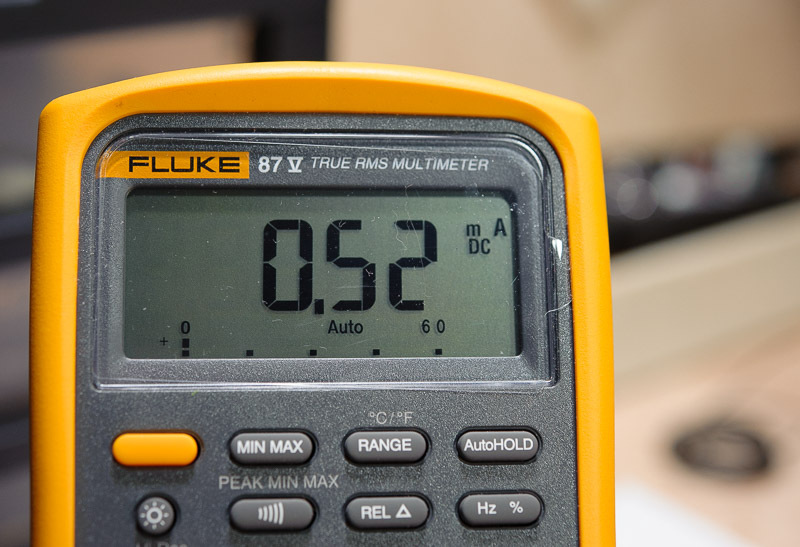 I bench tested the quadrature hybrid from 20.1 to 20.3 MHz and the phase shift was exactly 90 degrees. 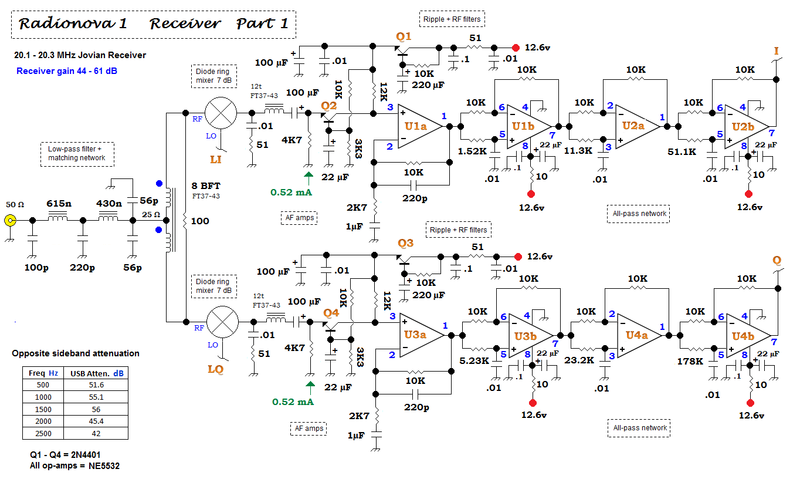 The amplitude difference gets cancelled with the balance trimmer in schematic Part 2. Above — Full on bench mode. 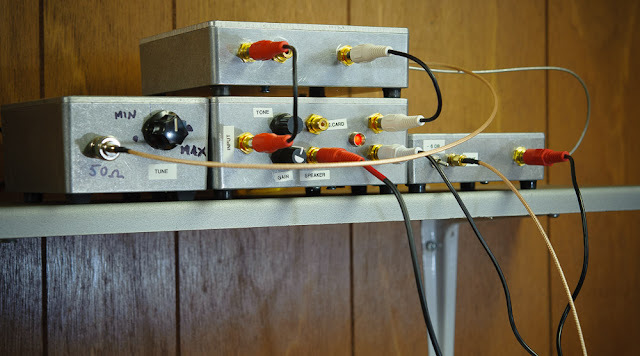 Temporary RF and BNC connectors allow situ testing. With extensive test as-you-go construction, we usually suffer no surprises when placing your completed work in an enclosure. Every op-amp was tested after soldering during the build up -- entire stages were swapped in and out during this build to learn what worked best. Above — Device in test mode. The Q original mixer was blown and got replaced with 1 I bought in ~1994 from the late Doug DeMaw. I boosted the side band suppression with the balance trimmer after originally getting 53.4 dB and writing in on the Cu+ clad board. Above — Testing the module with some other Jovian modules. More to come.